Like everyone in the running community, I was glued to my computer yesterday (unfortunately I couldn’t find live TV coverage) inhaling every bit of information surrounding the 118th running of The Boston Marathon. 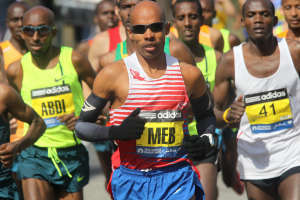 Kudos to Meb Keflizighi for being the first American male to win the race since 1983 and Rita Jeptoo for winning the women’s division again, while setting a women’s course record in the process. And a huge shout out to the other approximate 36,000 runners for pounding 26.2 miles through Beantown, as well as the hundreds of thousands of fans who turned out to cheer them on. I wanted to take a brief moment today to draw attention to two runners from the pack (bib #6878 and #21986 respectively). While neither of these ladies broke the ribbon nor made it to the podium, they are two other runners who encourage me to give it my all when I’m on the course (or just logging weekend miles). I’ve known Lisa Gilmore (#6878) for years. We both used to work together at a production/post-production house in Burbank. Typically our conversations had to do with video and audio, as back then I hadn’t gotten into running yet. Lisa has been running races for years and let me tell you this girl is fast… damn fast. I refer to her as “Speed Demon” because whenever I check her finish times it’s always impressive and makes me smile (and a tad bit envious). And not only that, Lisa is one tough lady. Not that she doesn’t get hurt; quite the opposite. I’ve read her Facebook posts about dealing with injuries and setbacks. I’ve felt her frustration when she is forced to take a “running break” or cut back drastically on mileage in order to heal. She’s got the heart of a true competitor and making her stand still is like forcing a racehorse to stay in its pen when what it really wants to do is run like the wind. Let’s just say Lisa knows how to bounce back. I’m amazed at how quickly she seems to get back into race shape (that’s determination) and before you know she’s racing again and letting the demon loose. 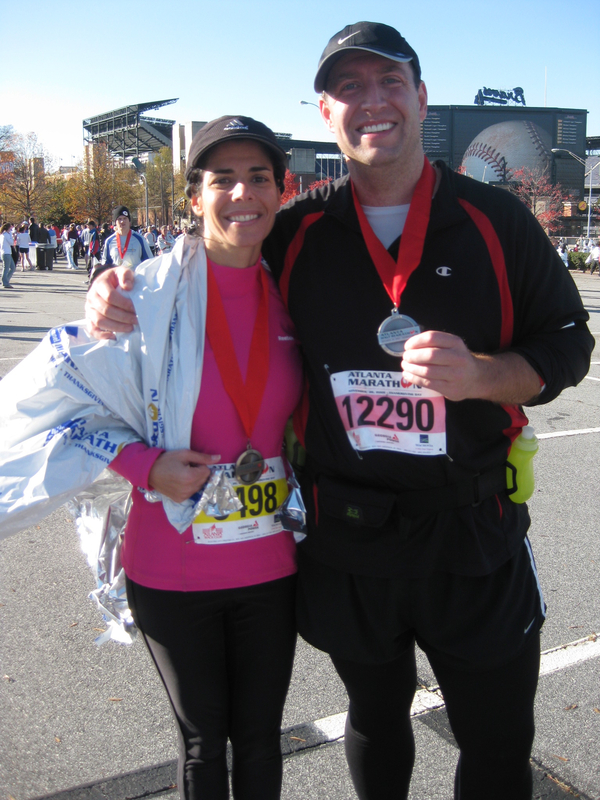 Lisa ran The Boston Marathon last year and fortunately had finished before the blasts occurred. When I heard the news about the bombing, she was the first person I thought of and I jumped onto Facebook to make certain she was okay. She was determined to run again this year and her story was recently chronicled in the Pasadena Star News… click here to check out the article. Lisa has been a huge supporter of my running since I first laced up my shoes and I’ve turned to her for both advice and inspiration. We keep in touch via social media and I occasionally see her at races (most recently at the Hollywood Half Marathon… she was doing the 10K to keep loose for Boston). I’d love to run a race with her, but let face it we’d just start together and I’d spend the next few minutes watching her get smaller as she disappears in the distance. Like I said, the girl is fast. Lisa’s 2014 Boston Marathon finisher’s time 3:08:38. As for the other half of my dynamic duo, I don’t have to turn any further than my own family. There are two runners in the “Devine clan”… and I’m the slower one. Me and Bonnie before Chicago 2009. My sister-in-law Bonnie (#21986) started running a few years before me and is one of the few people I know who is more obsessive and OCD (I say this in a good way) about it than I am. Her dedication and love of the sport (and its positive benefits) are infectious and she is one of the people who first motivated me to lace ’em up to begin with. And fortunately, she gave me great advice early on that helped me avoid some (not all… I can be pretty pigheaded) of the rookie running mistakes. Bonnie and I have done numerous long runs together whenever I visit Atlanta (we’re the only crazy ones getting up at 5:15 am on a Saturday morning) and I really enjoy that one-on-one time with her. I should clarify in that we drive to and from long runs together, because as I said before, I’m the slower Devine. So, as we’d drive to the park when we’d run, we both mention how far we were running and she’d calculate how long she’d have to wait for me to finish. Turkey Day Half in Atlanta. And it is funny that she and I can sit together and discuss running for hours on end. My brother usually just rolls his eyes and leaves the room, as he knows were going to do a marathon session discussing marathons. 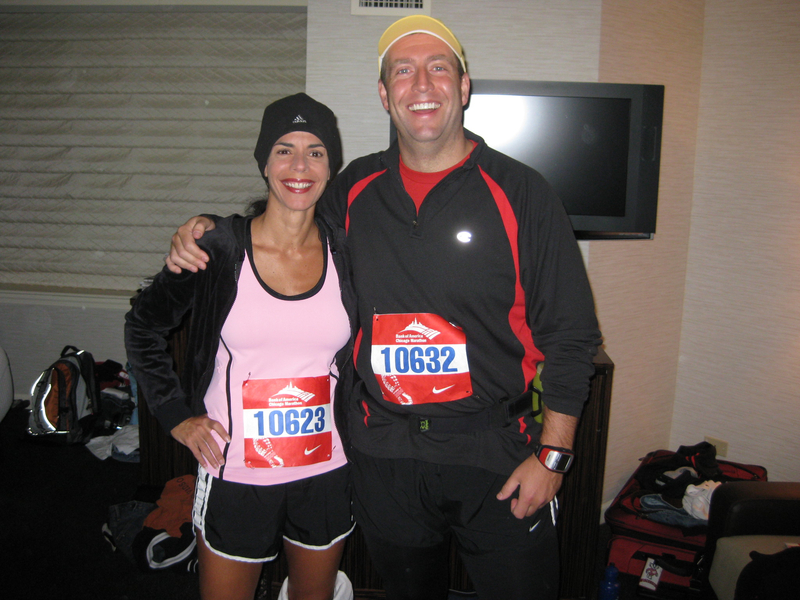 One of my fondest running memories was meeting up in Chi-Town with her and my brother back in 2009 when she and I both ran the Chicago Marathon (my brother provided crowd support and much cowbell). The night before the race my iPod died and I was totally freaked out that I’d have to run a marathon sans music. Lo and behold, Bonnie pulled out her back-up MP3 player (told you she was OCD in a good way) and just like that I had tunes… and you know her music mix wasn’t half bad. I also remember walking for 30 minutes to the start line the morning of the race, commenting on everything except for how utterly friggin’ cold it was (28 degrees, by the way). 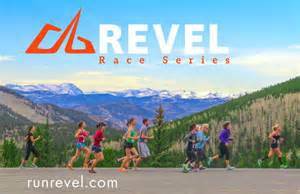 A really good time and a really good race. And like Lisa, Bonnie had also been bitten by the injury bug. A hamstring injury that appeared without warning sidelined Bonnie for a sizable potion of 2013. 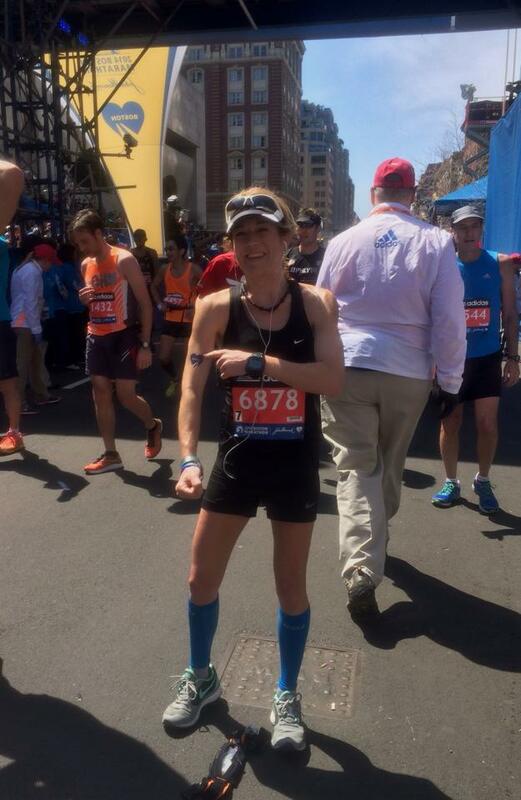 She was determined to get back in shape in time to run Boston and worked tirelessly with her rehab/training. So, with running Boston this year (and Chicago in 2009), Bonnie has now run 3 of the 6 major marathons (she’s also done NY, whereas I seem to be “lottery challenged”). I best pick up the pace if I ever hope to catch the “faster” Devine. Bonnie’s 2014 Boston Marathon finisher’s time 4:05:12. Congrats to Lisa and Bonnie (and the rest of the Boston bunch of 36,000) on besting “Heartbreak Hill” and finishing strong (and fast) at Boston. Posted on April 22, 2014, in General and tagged Boston Marathon, Chicago Marathon, Pasadena Star News, Running Inspiration. Bookmark the permalink. 3 Comments. You’re welcome Lisa… and thanks too. Congratulations to Lisa and Bonnie! !